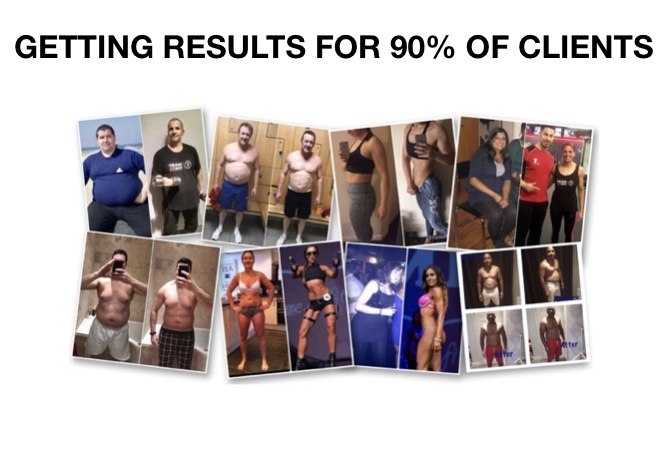 Personal Trainers - How to get results with 90% of your clients and build an ongoing portfolio of before and afters. As well as helping my own clients with their transformations, I've had a lot of questions recently from personal trainers and fellow coaches who want to know how to build a portfolio of before and afters and get results for 90% of clients that comes on to their books. So I decided to write this article for personal trainers and coaches, but it will also be of value to those who are looking for a PT or coach to help them with their fitness goals. I've had a lot of success lately with my own coaching business, getting results for over 90% of clients that I work with. ... but the really cool thing is 80% of my client base is now online, and most of whom I've never even met. "But Ed how do you know they're doing the work and listening to what you say?" "How do you push them if you don't even meet them?" These are all things that engrained into us from PT School and went through my mind as well. But if we look at the bigger picture stuff, and what really gets clients results, these questions and misconceptions become irrelevant. As fit pros we already know most of the results and changes made come outside the gym. So when we turn our attention there, it becomes very simple. Here are my top 10 tips for what I personally do to get results for over 90% of the clients that I work with (and mostly never meet). There's a difference between a personal trainer and a coach. A PT will take you through a great workout, but a coach will empower a client to making lifestyle changes that get results quicker and will last for years to come as opposed to relying on a PT and when they stop training with you, a lot of clients slip back into their old ways. By pre qualifying prospects before they sign up with you, you will only work with people that are a good fit for you and your specialities, and are much more likely to get that person results if they become a client. By helping everyone, you help no one. I used to do this. We have that mentality that we're self employed and have to take work when we can get it right? I get it... but by limiting who we work with not only gets you consistent results, but also makes you more in demand. My clients go through an application and a two call coaching process, and then I will invite a client to come and work with me if they're a good fit. 3/ FIND OUT THE REAL 'WHY'? It's really important that you find out your prospects 'WHY'. Often we fail to dig beyond the surface level stuff like "I want to get fitter" or "I want to lose weight". When you find out their pains and desires and the real problem and the real reason 'WHY'... It literally is a game changer. Think of why a client has invested in working with you. Its because they want to get a result that they haven't been able to get on their own. They think the solution to the problem is going to the gym, getting a PT, and going on a diet, because thats what they have been conditioned to think. In reality, they don't care about personal training, coaching, nutrition plans and the rest... All they care about is getting a solution to their problem. If you can help them find that solution, it doesn't matter how you do it... in person, online, phone or by whatever means you choose. They will love you forever and see you as THE ONLY SOLUTION. When we go on holiday we buy into lying on a hot sunny beach, not the flight thats gonna get us there. A client doesn't want to buy PT sessions, they want to buy a slimmer, sexier version of themselves. This again goes back to being a coach rather than a PT. When clients don't results as a PT the first thing we try do do is sell them more sessions knowing full well that isn't the answer. As fit pros we know that exercise is only a small percentage of what gets results. If we coach our clients to make simple lifestyle changes in and out of the gym, you will find they will have a much greater chance of success. 6/ ITS NOT WHAT YOU PUT IN THIER PROGRAM, ITS WHAT YOU TAKE OUT. As fit pros we're all guilty (myself included) of sharing our vast array of knowledge with our clients to try and justify why they've spent their hard earned cash to work with us. We design programs and talk about supersets, rep ranges, tempos, macros, nutrient timing and all the rest. For most clients, this is just another language and they switch off. Rather adding programs, nutrition plans, recipes etc. You'll get a client better results if you take all that stuff out and simply coach them to making 1-2 lifestyle changes. Its almost like we have to undo everything we've learnt, to meet the client where they are at. Selling a 'RESULT' as opposed to an 'HOUR' of your time is much more valuable to a client. Yes your time is of course valuable. But when you deliver results, your time becomes even more valuable and you should charge accordingly. Its always in the clients best interests when they are heavily invested and committed in the results. The more they pay, the more they pay attention. A client that invests 1-2k to work with you for 3 months is more likely to get results than paying £40 per session. Going back to tips 6 and 7... We tend to think, because we're charging more, we need to do or give more. More programs, more recipes, more time, more knowledge, and all this does is overwhelm the client. All the client cares about is results. All I do with my clients is agree on 1-2 small lifestyle changes a week. One of my over weight, over stressed, busy city guys that doesn't have time for the gym isn't going to benefit from a training and nutrition plan. I could simply get him to walk 10 minutes a day in his lunch break and he's gonna lose weight. This is a really over look quality of all great coaches. Talking should be 80% client and 20% coach. You can never truly help a client until you listen intently. If all you care about is talking sets, reps, and macros, you can't truly help someone. Yes all great coaches have a coach. All of the above will make even more sense when you have a coach. How can you expect clients to invest in you as a coach, if you don't believe in it enough to invest in a coach yourself. I couldn't see this until I had a coach myself. I have worked with other PT's and coaches an currently have a business coach who i'm working with. We are all on a journey of self improvement and growth and people want to be taken on a journey by someone who's on a journey themselves. Doing The Same Thing Over and Over and Expecting A Different Outcome?